SRACO Company. (SRACO), founded in 1982, is one of the oldest established independent companies in Saudi Arabia. Headquartered in Dammam, SRACO has offices in Riyadh and Jeddah. As a conglomerate, SRACO has a workforce of over 15000 employees gainfully employed throughout the Kingdom. 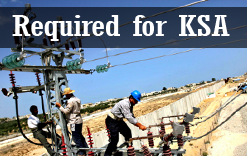 Free accommodation + other benefits as per Saudi Labour law.